Home canning tomatoes are the one thing that I do the most of every year. Most of my basic staple recipes just canned tomatoes in some way, shape, or form. Thankfully, tomatoes are also one of the easiest things to can! I want to note that tomatoes need to be canned with some kind of acid. 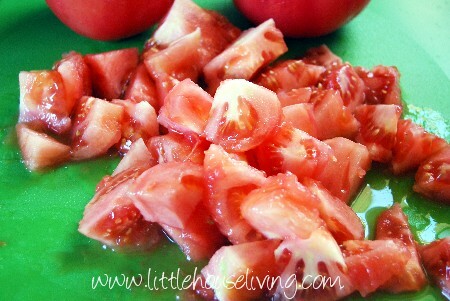 Lemon Juice, Vinegar, or citric acid (–Buy it from Amazon) will do to can tomatoes. Here is more info on the amounts to add. If you are brand new to canning you might want to check out my Canning and Preserving 101 video first. 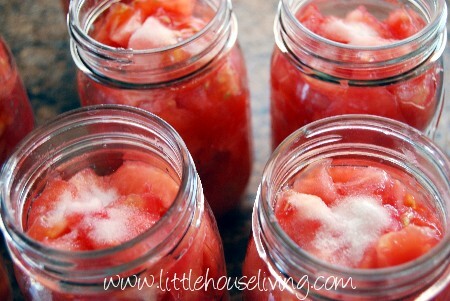 Canning tomatoes isn’t hard but takes up alot of room and many bowls in your kitchen! 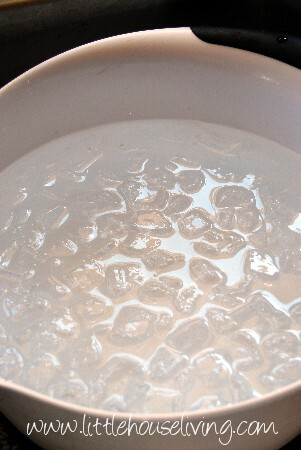 I start by filling a large bowl with water and ice. Make sure your jars are good and clean. If I have time and space I will run them through the dishwasher first since mine are stored outside, otherwise a good soapy hot water wash will be fine. Like I said above, choose your tomatoes wisely when canning. Otherwise make sure you have citric acid on hand. Fill a large stockpot with water and boil. When the water is warm, add in the tomatoes a few at a time. Only put in as many as you can handle at once. I used a huge saucepan for this batch I canned and only 4 of my tomatoes fit in. When the tomatoes are ready to take out, the skins will break. 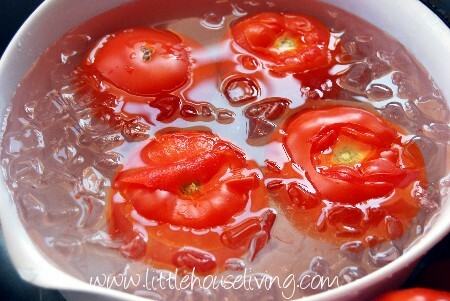 Move the tomatoes from the hot water right into the ice water. This makes them so easy to peel! 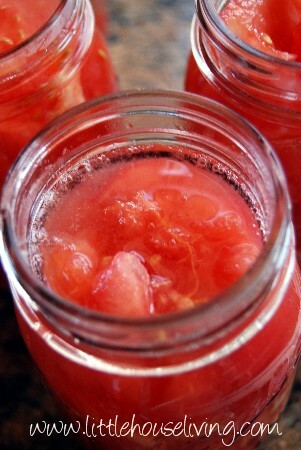 Use a colander to put the tomatoes in the jars. Pack them as tight as you can. Add in your chosen acid. You can add a 1/2 t. salt to each jar if you want. Use some kind of long straight utensil to get the air bubbles out of your jar. I know they sell a special “air bubbler” thing for this but I promise the handle of a spatula works just the same. 🙂 You may need to add more water as you let the bubbles out. 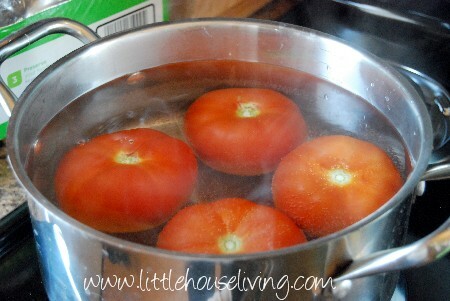 Add enough water to cover the tomatoes but leave a little bit of headspace. Ignore the amount of water in this jar, it’s a little too much! 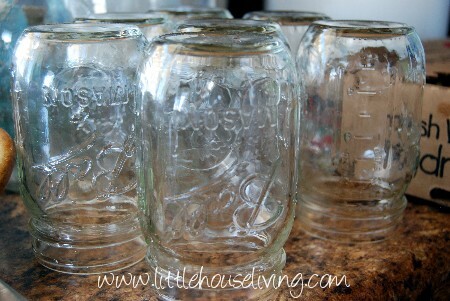 After you are done, wipe off the rims of the jars to remove any food pieces or stickiness. Put your lids on top the jars. Make sure to boil the lids in hot water first. Add the rims on. If you are using regular lids make sure you tighten the rims very tightly. If you are using Tattler just tighten enough to keep the lids on. Fill your hot water bath canner with water and bring to a boil. 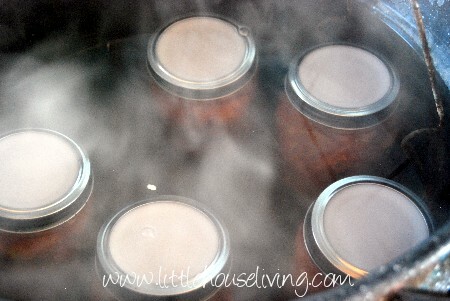 Add in the jars and make sure the water is covering them. Process for 45 minutes for quarts or 35 minutes for pints. Remove carefully when you are done. I always cover the countertop with flour sacks and put the jars on top of those. 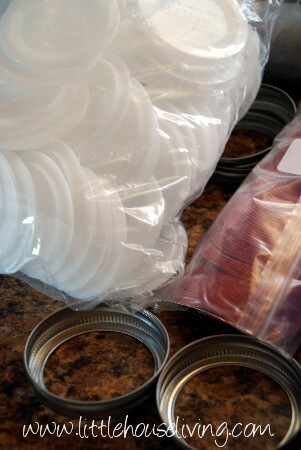 If you used Tattler lids make sure to tighten the rims as soon as you pull them out of the hot water. Otherwise do not disturb the jars until the lids have sealed. 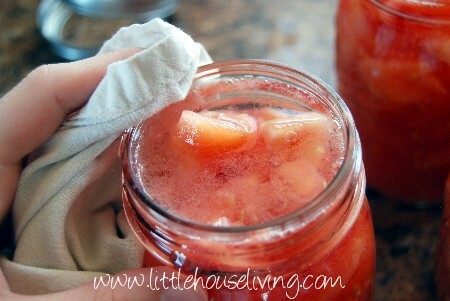 Have you ever tried home canning tomatoes? 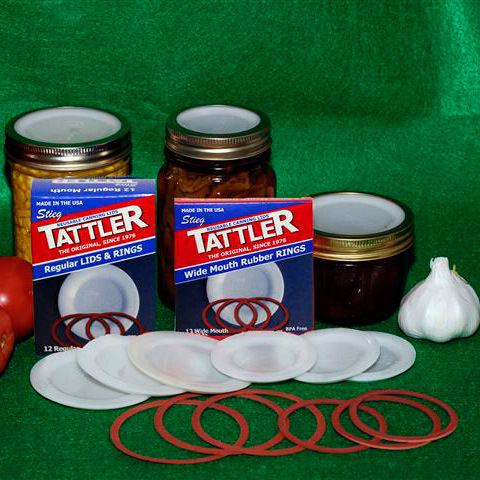 Do you like using the Tattler lids? They take some getting used to. I pretty much bombed the first couple batches I did with them. But I’m starting to get the hang of them now 🙂 I love that they are BPA free and reusable! I wouldn’t bother investing in tattler lids if you haven’t already, they contain formaldehyde. Very disconcerting since you’re trying to stay away from BPA! Use what you have and be sure to not store jars on their side so the food is not touching the lid – whether Tattler or Ball or whatever. You’re doing the best you can by providing whole foods for your family. In the meantime what’s with these companies using all these unnecessary chemicals!! And shame on Tattler for touting they are BPA free only to use another chemical. Seriously. You can’t win for losing, you just do the best you can. It is true that trace amounts of formaldehyde are present in the plastic. However, molecular breakdown and subequent release of formaldehyde does not occur until temperatures exceeding 429 degrees are reached. A pressure canning temperature above 250 degrees is entering the danger zone, and temperatures of the level required to cause formaldehyde concern are far in excess of any safe canning environment. I read that jargon too, I’m sure that Ball will tell you also that the BPA used is ‘within safe USDA/FDA standards’ as well… it’s not a criticism that you’re using them, I just hate to see someone else go out and spend a mint on Tattler when they may not be any safer than BPA, after all the governmental entities that be insist trace levels of BPA are safe. 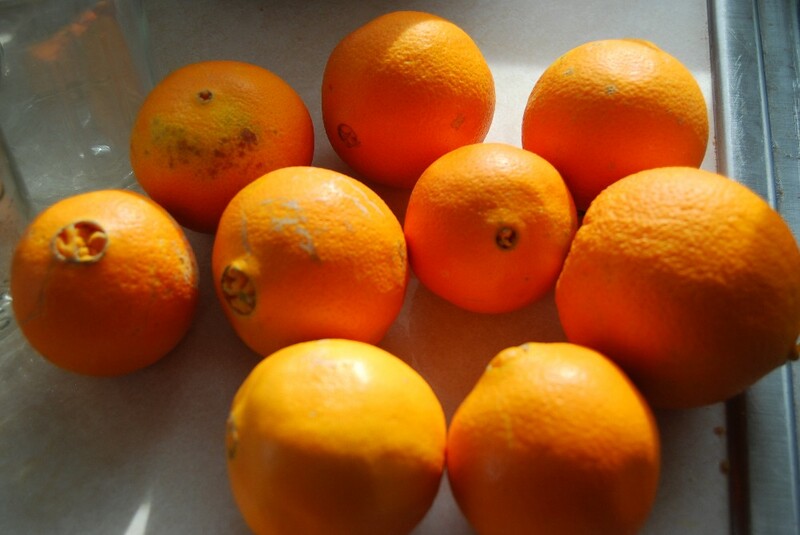 Could you please tell me where to buy citric acid. I have tried the grocery store and pharmacy as well as my local Whole Foods store and cannot find it. Thanks. A tablespoon of lemon juice works, too, and I couldn’t taste anything different. You can also use 2 tablespoons of lemon juice per quart and 1 tablespoon per pint. Hope that helps!!! 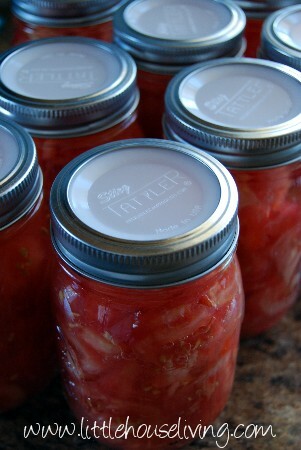 Canning is my hobby, and canning tomatoes is a major part of my efforts to preserve food. I have been also canning meats of every kind, including roast beef, sausage patties, hamburger, steaks, salmon and loads of chicken. A few weeks ago I shopped at our local Aldi store, and their huge Pilgrim’s fryers were on sale for $.63/lb. Today I finished canning 8 of the chickens, (except for the legs and giblets which I froze) and got 39 jars of chicken meat and twice that of just broth. The price averaged $.62 per wide mouth pint jar just for the chicken meat. I consider the broth free except for the lids. I always keep jars and rings on hand. Now I can make any chicken casserole, jambalaya or anything that calls for chicken meat add some of those delicious canned tomatoes to just about everything, and have a nice meal within 20-25 minutes!!! Thanks for all of your posts! Hugs from Miss Jimmie in Arkansas. 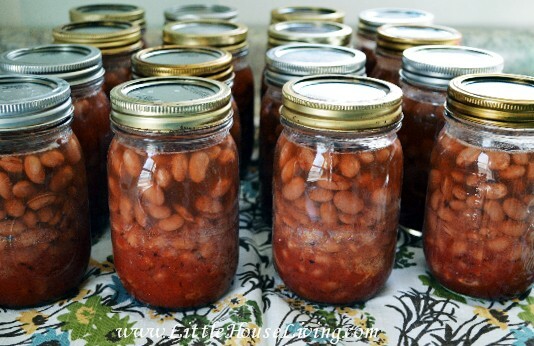 Ms. Jimmie Daughters, I have been scared to try canning any kind of meat. Do you feel it’s any harder to process than vegetables? Do you precook your meat, or put it into your jars raw? Does the meat turn to “mush”? (I’m just full of questions.). Rhonda, I plan to have a post on canning meat coming up later this summer. I am in love with your photos 🙂 Beautiful! I shared your article. 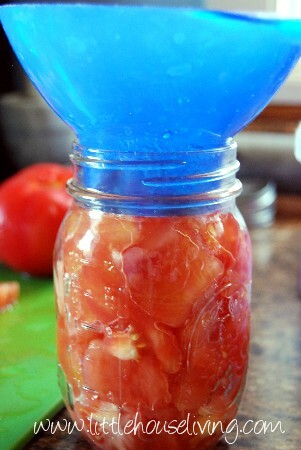 Do you make things from the tomatoes then can that, for example make ketychup, spaghetti sauce, salsa, pizza sauce, etc? In past years I blanched and froze all my garden tomatoes but this year I was thinking of making the tomatoes into the things I use them for often in large batches and canning them. I’m hoping to save time and enegry in the future so I can just grab a can of spaghetti sauce and have dinner ready, a lot faster than having to thaw it and then make it into sauce or whatever. Any thoughts on this? Would I do it the same? I have never canned before. Do you have to have a gas stove to can? Thanks! No necessarily. I use an electric stove but it has to be one with coils, not with the glass top because they can’t handle the weight and won’t get warm enough to be able to properly seal jars. Darn! My mom has a gas stove, but I have an electric one without coils. Maybe I can try at my mom’s. The link you provided for the pressure canner says it is safe for glass top. I have a glass top and have been hesitant to buy a pressure canner. A couple of Christmases ago, my oven caught fire while I was baking. Had I known then, what I know now, I would have kept the old stove because the coil top still worked fine. All I would have had to do was remove the heating element from the oven. I sent it off to be recycled. lol Oh well, live and learn, right? I would also be hesitant about using a pressure canner on a glass top. I’ve heard that the temperature doesn’t get hot enough to properly seal and it’s too heavy for the stove top. Just wanted to add that some glass tops are fine with canning either water canner or pressure canning, BUT you need to check with the manual of the stove to be sure. I have a glass top and it is fine and I do a good bit of canning on it. I can, both hour water bath and pressure, on my flat surface stove and have had no problems. Last year I can up over 250 quarts of home grow goodies. I’ve only ever used a pressure cooker for canning things, because my mom has one. I have heard of using a hot water bath, but I just thought people did it in the sink or something. What is a hot water bath canner? I show one in my video here: http://youtu.be/YFnMjtEydrs It’s basically like a big stockpot! We just put a few qts of tomatoes up today. Did the hot water bath and it was not hard at all. 🙂 Knowing that you are putting food up for your family for the winter really gives you a good feeling!!! I know costs vary by area when it comes to produce but I’m curious on what everyone feels is a good price (for your area) to pay for produce when it comes to canning? Everything I read says I have to add lemon juice or some kind of citrus? Analisa, if you use a conventional or hybrid tomato, yes you will need a little acid. If you can an heirloom and possibly organics you shouldn’t need it. The reason is that newer tomatoes are bred now to have less acid in them so to be able to hot water bath them you will have to add acid back in. If you pressure can them you don’t need to worry about them being low acid. I pressure all of my tomatoes and tomato products. Canned salsa today. Only 7 pints but it’s a start. Making vegetable soup tomorrow with some green beans and corn and maybe try to can some corn. We grew our own green beans and I bought sweet corn today for $3 a dozen. Tou don’t process for very long are you at sea level? I’d love to cut my processing time. I am at 3000 feet here. I have 20 lbs of tomatoes that I got from Bountiful Baskets this weekend. And I am wanting to make salsa and pasta sauces to can. Have you got any helpful recipes and what I should to can salsa and pasta sauce? Thank you ahead of time. 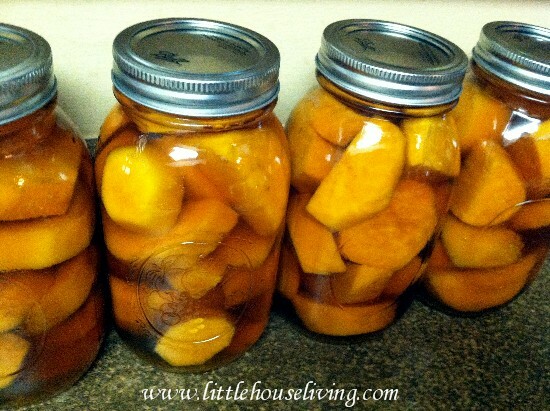 I have a glass top stove and do all types of canning and pressure canning. Caution is to put canner on and add weight slowly as you work, rather than all at once. I don’t have trouble keeping temp high. Puts alot less heat in the kitchen than a gas stove. I do rawpack chicken several times a year. Throw in boneless skinless chicken pieces, add salt, and pressure can for 90 min. It makes it’s own broth. Sometimes I add lemon slice or onion for variety. Pre-cook ground meat before canning it. I add garlic, onion, and sometimes taco seasoning then a little bit of water since it has already lost it’s ‘juice’ by precooking. I grew Romas and Big Boys this year, and have already water-bath canned several batches-have been doing so for years (only my second year with Romas though) and never had any problems. I bought them from a local nursery. Are they considered heirloom? And should I worry about the stuff I’ve already canned this year? Thanks! Honestly I don’t worry too much about it but that’s just me. If you don’t feel comfortable with them than don’t eat them. But if they look and smell fine (and you plan on cooking them, not eating them raw) you should be ok. Yes you can. 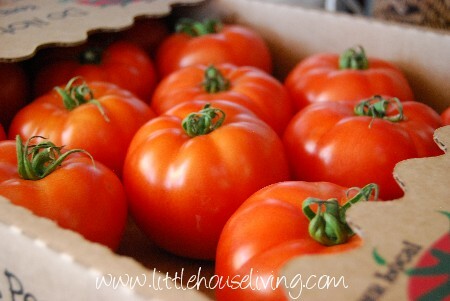 They probably won’t have the same flavor as vine ripened tomatoes but you can still can them! After I cut-up the tomato’s to can, I take all the leftover juice and boil it down to a point that it’s thickened as tomato juice to can. Add salt and can like tomato’s. Delicious! Can we pressure can the tomatoes? If so how long do I process them?I like to pressure can them because you can can more at a time.thank you. Yes, tomatoes can be pressure canned at 11lbs for 25 minutes. Don’t forget to adjust the pounds for higher altitudes. 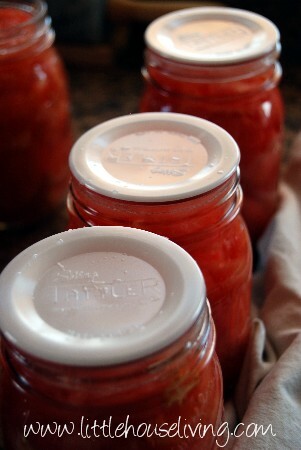 Have you done a post of what you use your home canned tomatoes in? And do you ever pre-season them with spices? 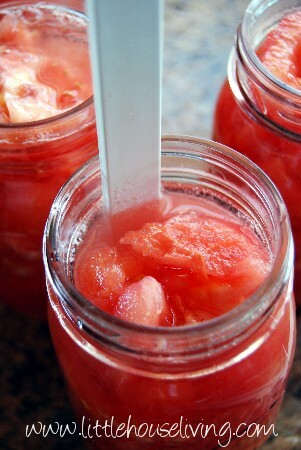 In just about any recipe that I have listed that uses “stewed tomatoes” I’m using home canned. I usually don’t add any spices and just can them plain so we can do anything we want with them later and aren’t limited. I know you can wash and put your tomatoes up in large heavy zip bags whole, yes whole in the freezer for the winter. Take out what you need and pop them in soups, or pasta sauce. If you need to defrost them, do so.